Are you looking at your galvanised metal surfaces wondering where to start with your paint work? Let us help! It doesn’t have to be a difficult task to keep galvanised metal surfaces looking great for as long as possible. Using mobile and know what you want? Head straight to the shop here. The problem with painting galvanised metal is that the surface when new is very shiny and smooth, making it difficult for paint to stick to the surface. It also has surface contaminants (oils, greases, residues, etc.) left on the surface from the manufacturing process that interfere with the adhesion of paints. You need to tackle this with the right products and preparation to make sure it stays put. You’ll notice on surfaces that haven’t been treated properly, that the paint will peel and blister very quickly. If you want to paint a galvanised surface, you need to prepare it properly with thorough cleaning and a good primer where required. Thoroughly wash with an alkaline cleaning solution (something like Rust-Oleum Mathys ND14 Cleaner Degreaser) using a Scotch-Brite pad to scrub the surface. Once cleaned, thoroughly rinse down with fresh water and allow to dry. Now you’re ready to prime with something like Rust-Oleum 3202 Galvinoleum Primer. This primer is a one step solution that can stick to nearly any smooth surface including galvanised metal. Apply it with a brush and its ready to recoat within 30 minutes with a compatible topcoat. Alternatively, many professionals will skip this time consuming process by treating with Mordant Solution, or T-Wash as it’s often called. This is an acidic solution of a copper salt for the pre-treatment of clean zinc surfaces to provide a good key for paints which would otherwise show poor adhesion. Once treated with Mordant Solution the surface can be painted as normal and no special adhesion primers are required. If the galvanised metal you’re intending to paint has been left out in the elements for 12 months or more then the tricky cleaning process of removing all the manufacturing contaminants has been carried out for you. All you need to do is clean any dirt and grime that has built up on the surface and apply a ‘direct to galv’ paint like 1805 High Build Vinyl Finish. This paint produces a high build, tough and weather resistant, flexible sheen finish that is often chosen by tradesmen due to it’s fast drying times. You’ll want to remove any old flaky paint with a non-metallic abrasive (sandpaper) and wash down as you would with new galvanised surfaces (see above). 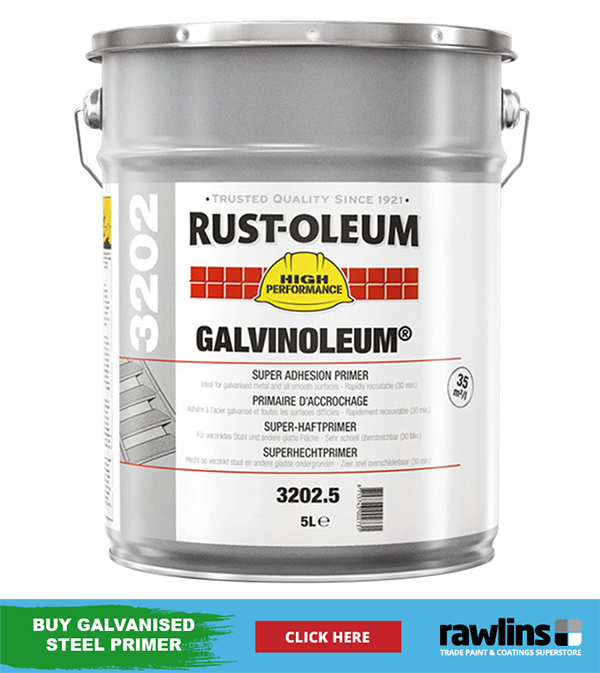 Once it’s ready, you should apply Rust-Oleum 3202 Galvinoleum Primer to any bare galvanised surfaces. It is possible to paint galvanised metal in the full range of industry colours available, without flaky and peeling paint. Once you’ve prepared your surface and primed it if required, you can feel reassured that your paint will look great. To make sure it really has staying power, you need to use a high quality topcoat designed for these kinds of surfaces such as Rust-Oleum 7500 Alkythane. 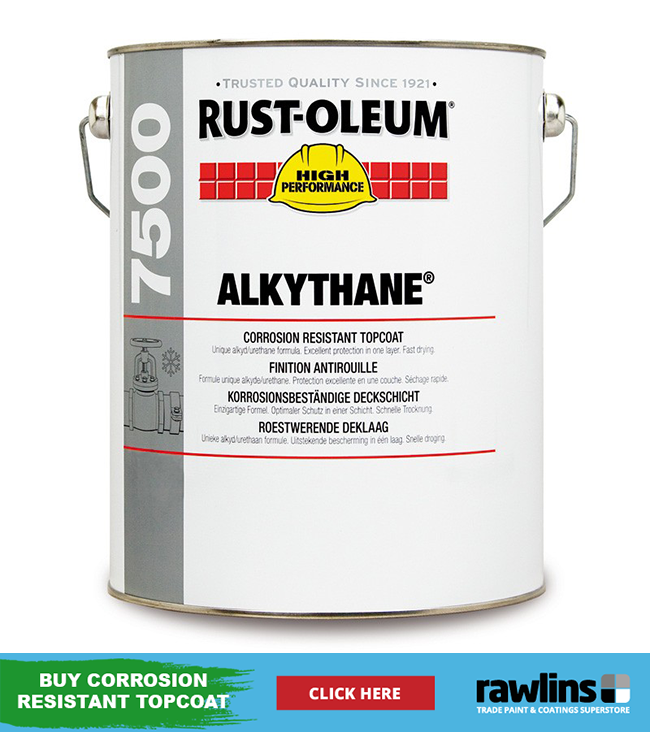 Rust-Oleum 7500 Alkythane comes in a wide variety of colours, including metallic and can be produced in a gloss finish or a satin finish. Apply this paint by brush, roller or spray and you’ll have a fantastic looking surface, that is protected and can last. If applying to galvanised surfaces that have been prepared with Mordant Solution then prime first with Rust-Oleum 1080 High Build Primer, this will ensure excellent corrosion protection and lasting flexibility. We hope you’re ready to get painting – don’t forget we’re here to help if you have any questions! Looked at many sites but nobody seems to cover the best way of preparing old galvanizing in this case a trailer that has been in salt water and is probably 20 years old. It has a sort of encrustation on the surface and a few areas of rust but not much. I have some Scotchkote epoxy 152LV paint to use only £124 a pot so I don’t want to make a mistake in prep. The 3M Scotchkote Epoxy Coating 152LV is not suitable to be applied to galvanised substrates, none of the 3M heavy duty systems are. If the trailer is going to be put back into the water, the surface will need to be abrasive blasted as a minimum. I have two dorma windows in the front of my house. One has a copper roof, which is now green with age. The other has a more traditional lead roof. I would like to paint the edge of the copper roof to match the colour of the lead – just will look better. Could you please advise how to prepare the copper surface and which paint am I best that will give a long life. Thank you. For the copper, it would need to be clean and dry before applying a coat of Zinsser Bulls Eye 1-2-3 which we’d recommend having tinted to grey as green staining can sometimes leach through the 1st coat. 2 coats of Zinsser Allcoat Exterior Matt/Satin/Gloss would then be recommended as the topcoat, which is available in any RAL or BS colour to match in with the lead. Is there anything else we can assist you with or further products you’d like information about for your project? Given that this is for a utility room sink, we could consider a system of Rust-Oleum 9169 Epoxy Rust Primer and Rust-Oleum 5500 Solvent Free Epoxy in white. I’m roofing a small outhouse with new galvanised corrugated steel sheeting. I’d intended to wash off any grease with a mild caustic solution before installing. When dry and after installation I was intending to paint with a couple of thick coats of solvent-based bitumen. Anyone see any problems. please? We would recommend applying washing down with Rust-Oleum Mathys ND14 Cleaner Degreaser, priming with Rust-Oleum PVDF Primer and finishing with Rust-Oleum Mathys Noxyde Pegarust. Please refer to product data sheets for application procedures for each. Is there anything else we can assist you with today? Any ideas of how to stop condensation on the underside of the corrugated steel sheeting? Please see our recommendation below to coat your new galvanised steel sheet ceiling (internal, underside) to help prevent the formation of condensation forming. The following products can be applied by brush, roller or conventional spray (not airless). I have an underside of a corrugated galvanized metal roof that is a large overhang on one side of our building. Thus the underside is open to the elements. It was painted many years ago with what seems to have been a latex paint. It is now peeling and chipping in some areas and we’d like to clean it up and repaint. We thought about wet blasting to remove the paint, but perhaps this will damage the galvanizing? What steps would you suggest to bring this back to life with a top coat of color? Thanks for your time! Remove oil, grease and all other contamination by alkaline or high pressure (steam) cleaning in combination with appropriate detergents. Remove rust scale, loose mill scale, loose rust and loose coatings by scraping and wire brushing to St 2/3 (ISO 8501-1 : 1988), blast cleaning to Sa 2½ (ISO 8501-1 : 1988) or sanding, followed by priming bare areas of galvanising with Rust-Oleum 3202 Galvinoleum Primer. Sand previous coatings in good condition to provide a key for adhesion and check compatibility. The surface must be clean and dry during application. Then apply 2 coats of Rust-Oleum 7500 Alkythane in the chosen colour and finish to all prepared/primed areas. Please let us know if there is anything else we can help you with today. You can follow us on Facebook too, if you’d like to keep up to date with our posts and special offers in newsletters we send out. We are buying a boarding kennel and the current galvanised panels and mesh look dull with a few rust patches all still solid. What is the best way to make them look shiny and new? We also need to paint the concrete floors to seal them, dogs tend to wear the floors quite a lot and they also have to be hygienicly cleaned every day, what is the best hard wearing paint you would recommend for this? For the galvanised mesh fencing we would suggest Rust-Oleum Hard Hat 2117/1017 Galva Zinc Alu assuming the dogs cannot get to these areas to chew, scratch, etc. For the floor area we would recommend thorough preparation according to the manufacturers requirements then Rust-Oleum 5401 Epoxy Impregnation Primer followed by two coats of Rust-Oleum 5500 Solvent Free Epoxy. If colour stability of the floor is critical, please advise. Wow thanks for so much useful info. Im hanging a vintage light fixture outdoors. 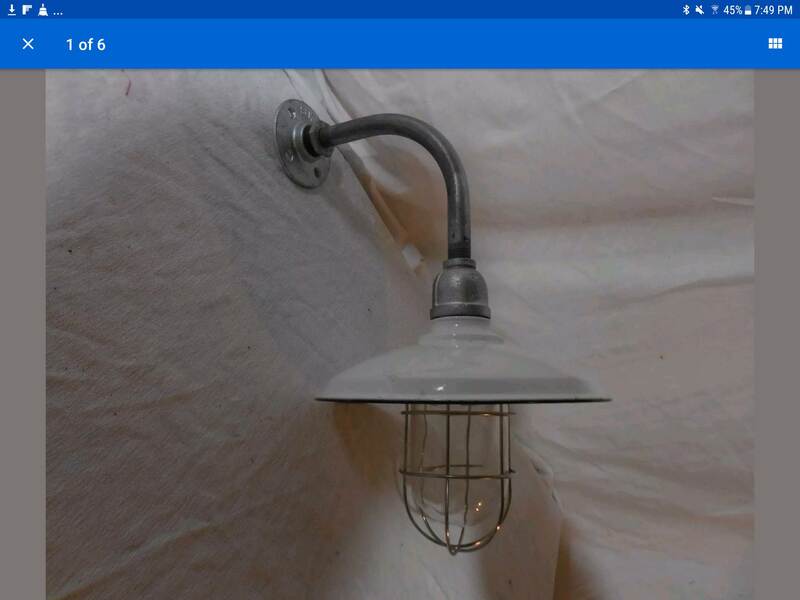 The fixture has been refurbished using a gooseneck galvanized pipe and galvanized fitting. I would like to finish the galvanized bits with a satin black paint. Am i good to go using the rustoleum primer and paint you suggest above, would a brush on paint provide better presentation and durability? 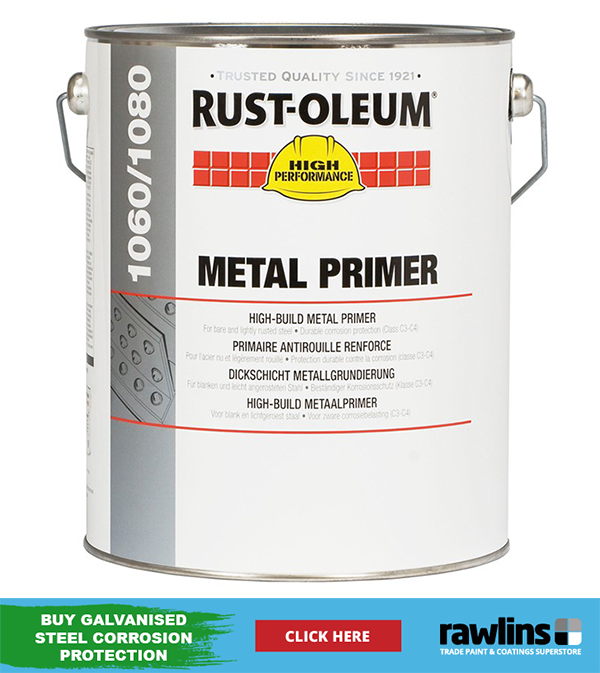 An ideal system for smaller galvanised items requiring painting would be Rust-Oleum 3302 CombiPrimer Adhesion followed by Rust-Oleum CombiColor. These both come in aerosol and brush/roller applied versions. Let us know here, or on Facebook how the finished result looks! Thanks very much Mark. it appears that the products recommended are not offered here in the states. Do you think this product*, a latex aerosol, would offer good performance? Wow, lots of useful info. I would like to give a face lift to our galvanised metal pig ark. It is weathered but not rusty. I want to paint it in fun colours. I don’t need a perfect finish, but would like it to last a while. What should I use and is prep necessary? I can’t find the answer anywhere. What do you suggest? Thanks in advance for your help! Thoroughly wash down all areas with Rust-Oleum Mathys ND14 Cleaner Degreaser, then prime bare galvanised areas with Rust-Oleum 3302 CombiPrimer Adhesion, then to all areas apply two coats of Rust-Oleum CombiColor in your chosen colour. Please let us know if there’s anything else we can help you with today on this thread, or via our Facebook page. The residents of our village are keen to repaint railings either side at both ends of a road bridge over a stream at the entrance to our village – the Council not having funds for this kind of work. The railings appear to be galvanised metal (steel?) and have been painted some years back, with half the white paint now peeled off. The cross section of the railing is round and about 70mm diameter. The two horizontal rails and about 10 vertical add up to around 100metres of railing. How should be tackle this? We have no handy water supply but do have a portable generator and have made arrangements for traffic control. Some idea of cost also useful. In answer to your question and location limitations, clean and degrease all surfaces with Rust-Oleum ND14. Abrade all existing coatings to provide a key/remove all loose and flaking material back to a sound, feathered edge. prime all areas of bare galvanised metal with 1 coat of Rust-Oleum 3202 Galvinoleum Primer, then coat all surfaces with 2 coats of Rust-Oleum 7500 Alkythane. For cost, if you ring our sales team on 0113 245 5450, or email [email protected] they will be able to assist you with a quote for the quantities required. Hello – I have an old galvanized tin/steel washing bath that I want to turn into a wildlife pond. There are areas of minor rust inside it, what is the best way to prime and paint it to hold water? Also I would like to paint the exterior, what would you recommend ? The first thing to ensure is that the rust is treated, it should be rubbed down to bright metal, if this isn’t 100% possible then Teamac Rust Converter should be used. The bath then should be treated with T-wash (Mordant solution) to ensure the surface is prepared correctly to take a primer. Once prepared, 2 coats of Teamac Metaclor Underwater CR Primer should be applied followed by 2 coats of Teamac Chlorvar Chlorinated Rubber Paint, this is for both the inside and outside of the bath. Once your final coat has been applied it is important to leave it 14 days before filling it with water, before filling the bath you should rinse it a number of times with fresh water to ensure any residual solvent isn’t present in the final fill. I have a 30 year old large steel Cardale garage door which appears to have a white plastic coating over a galvanised surface. The plastic has almost completely peeled away leaving a very shiny surface. What is the best and most economic way to paint the exposed galvanised door with a white finish? Thoroughly clean and degrease the garage door, then prime with Rust-Oleum 3302 CombiPrimer Adhesion followed by 2 coats of Rust-Oleum CombiColor in the desired colour and finish. Previously for similar projects we have recommended Rust-Oleum 9169 Epoxy Rust Primer followed by Rust-Oleum 5500 Solvent Free Epoxy in white. However, we have no experience of it being used for a bath, so we would have to recommend you carry out some trials to ensure it provides the desired finish, adhesion, performance, etc. Please let us know if there is anything else we can help you with, on this post, by contacting Rawlins Paints by email, or via our Facebook page. Can you please advise on treatment of a galvanised metal staircase. The fixing bolts and some balusters have surface corrosion, however the rest is ok, just dirty. Can I clean and treat the corrosion but not apply any decorative coating. Would prefer to leave with just the original galvanised finish as it’s in good condition. Assuming the surfaces that require repair are not subject to foot traffic, one of the Rust-Oleum ‘Galva’ products would allow you to maintain the bare galvanised look of the staircase. Rust-Oleum Galva Zinc (2185) offers the best protection, Rust-Oleum Galva Expresse (2180) is the quickest drying, Rust-Oleum Galva Zinc-Alu (2117) gives a happy medium between protection and finish and Rust-Oleum Galva Plus (2120) gives the nearest appearance to new galvanised steel. We had a galvanized railing installed in January (about 5 months ago) and were told to hold off on painting it for 6 months. Ostensibly this was to allow some weathering which would then let the paint adhere to the metal but the advice above says it should be out for 12 months. With only 6 months of exposure should we still use the alkaline cleaner? Yes, you should still use the alkaline cleaner. I’m looking to refurbish an existing galvanised steel gate, I will be adding new steel to it also. What would be the best way to prep and paint, and which products should I use. We want it to be black by the way. Thanks for your question on this post. We would recommend Rust-Oleum 3302 CombiPrimer Adhesion followed by Rust-Oleum CombiColor. CombiColor is available is a vast range of colour options, including black. I have an old galvanized grain bin that I want to paint. It has some rust and corrosion. What prep work and paint do you recommend? Were there any specific products discussed in this post about surface preparation and painting galvanised steel that you require further information on? Each products’ datasheet will include additional technical information, too. If there is anything discussed in this post about prep work and paint you are specifically requesting more information on, we will be happy to assist – but your question is rather broad, as the whole post is about this subject. I have a galvanised nissen hut which needs a coat of paint. It has previously be painted in grey but this is flaking and needs to be re-done. Please can you advise me of the best paint to use. We would recommend Pegarust (here) for this. Please let us know if there is anything else we can help you with today. I am wanting to paint old (10 years+) galvanized posts that make up the framework of our tennis court fencing. What prep would you recommend and then what primer/paint would you recommend? Thanks! For preparation and painting, we would recommend Rust-Oleum Mathys ND14 Cleaner Degreaser followed by Rust-Oleum 3202 Galvinoleum Primer finished with Rust-Oleum 7500 Alkythane. Building Regulations Approved Document B (Fire safety) – What Does it Mean for Me?